The Wallop Howard Leadership Award is presented to individuals in the public sector who have displayed outstanding commitment to improving the lives of our nation’s young people and providing critical support in The Congressional Award Foundation’s efforts to make the program a national opportunity. The award is presented by The Congressional Award Joint Leadership Commission, comprised of the Speaker and Minority Leader of the House and Majority and Minority Leaders of the Senate. The Horizon Award is a special recognition from the Joint Leadership Commission of The Congressional Award Foundation and its Board of Directors. The Horizon Award is presented to individuals from the private sector who have contributed to expanding opportunities for all Americans through their own personal contributions, and who have set exceptional examples for young people through their successes in life. These recipients have truly forged ahead, establishing noble horizons to which our youth can aspire. The NFL’s all-time leading passer and his wife, Brittany, are presented by Senator David Vitter and Chairman Paxton Baker. 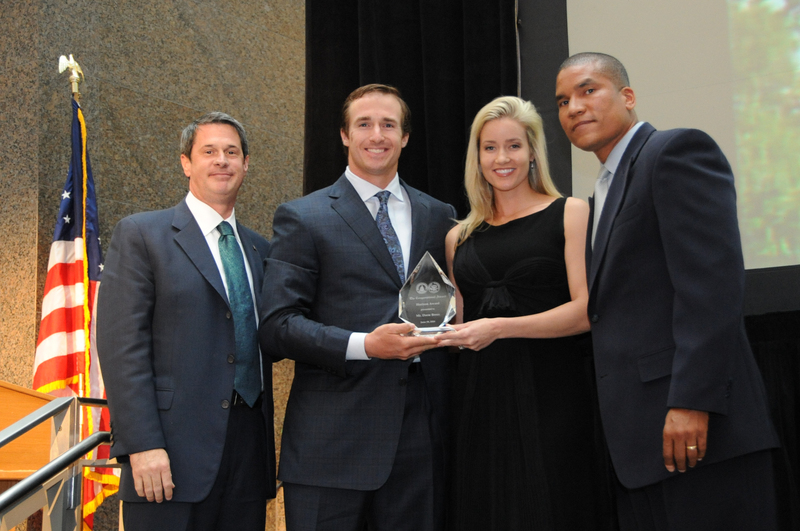 A recipient of the NFL’s Walter Payton Man of the Year Award, Brees founded his own non-profit organization, The Brees Dream Foundation, to provide care, education, and opportunities for children facing adversity. 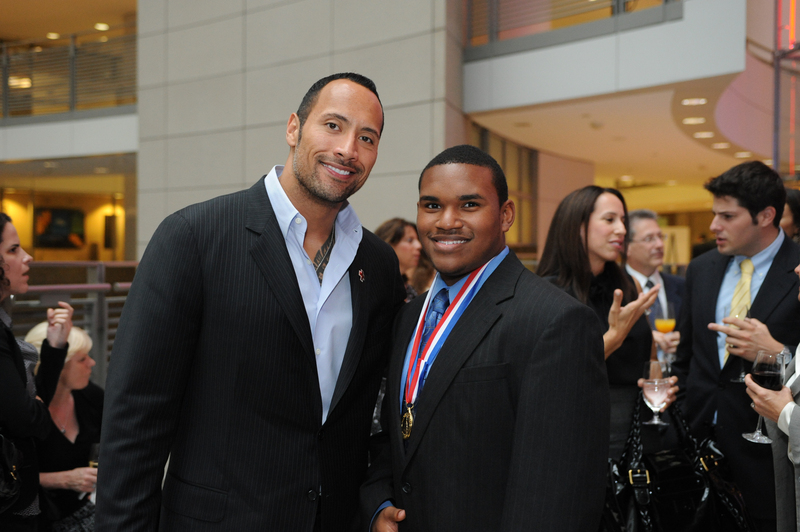 Former WWE superstar and now one of Hollywood’s leading men, Dwayne Johnson, chats with Gold Medalist Allante Nelson. Johnson created The Rock Foundation to educate, empower, and enrich the lives of children worldwide through its youth physical fitness and obesity prevention program and its educational worldwide giving program. 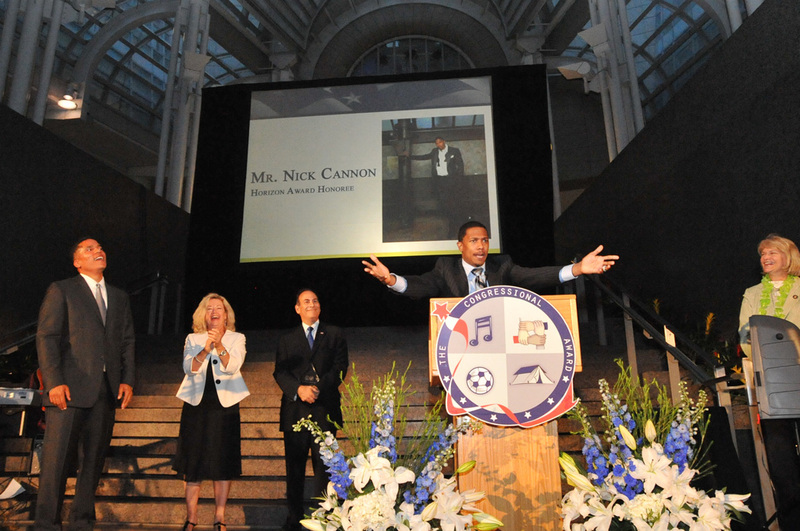 At the time of recognition, Nick was named Honorary Chairman and development consultant for TeenNick. In this role, he provided his insight and knowledge as Nickelodeon sought new means for reaching teen and tween audiences. He also hosted Nickelodeon’s HALO Awards, an hour-long special celebrating ordinary teens who make a difference in the world. Mr. Solomon served Major League Baseball in a variety of executive operational capacities. 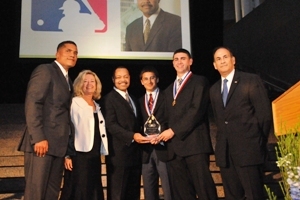 Our Foundation recognized his vital role in the MLB Urban Youth Academy in Compton, CA. This academy served as a sanctuary for kids interested not only in how the game is played but how the game can impact their lives. 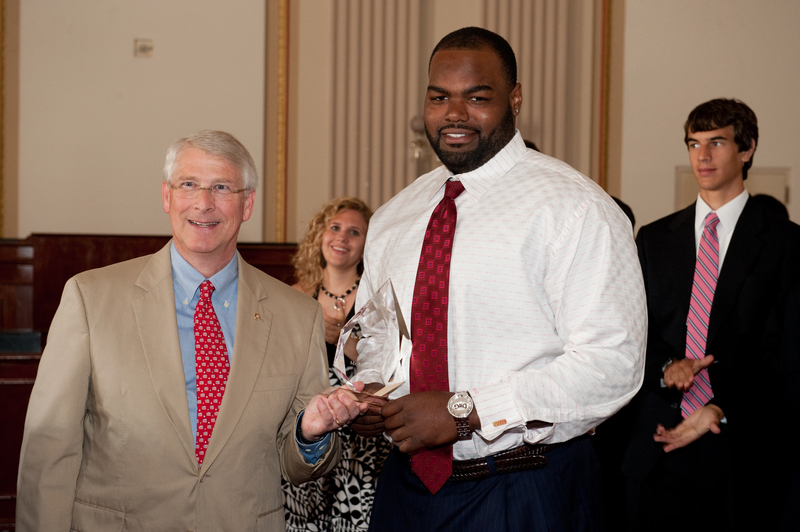 Senator Roger Wicker awarded the NFL player for his ultimate “beating the odds” story. Michael’s high school life was the subject of Michael Lewis’ book The Blind Side: Evolution of a Game and the Academy Award winning film The Blind Side. Oher’s story is one of inspiration, overcoming even the most insurmountable obstacles, like homelessness, to achieve a dream. 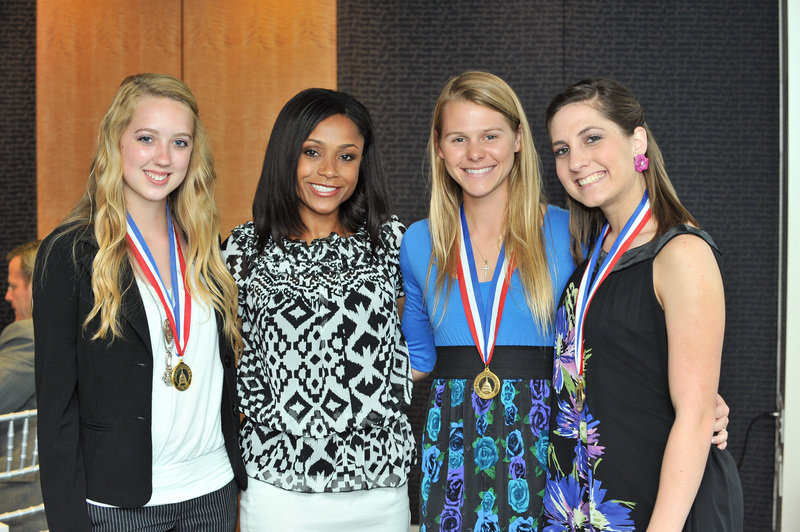 U.S. Olympian Dominique Dawes poses with Congressional Award Gold Medalists before the presentation of the Horizon Award. Her emphasis on goal-setting, as co-chair of the President’s Council on Fitness, Sports and Nutrition, echoes what our outstanding youth also strive to accomplish. 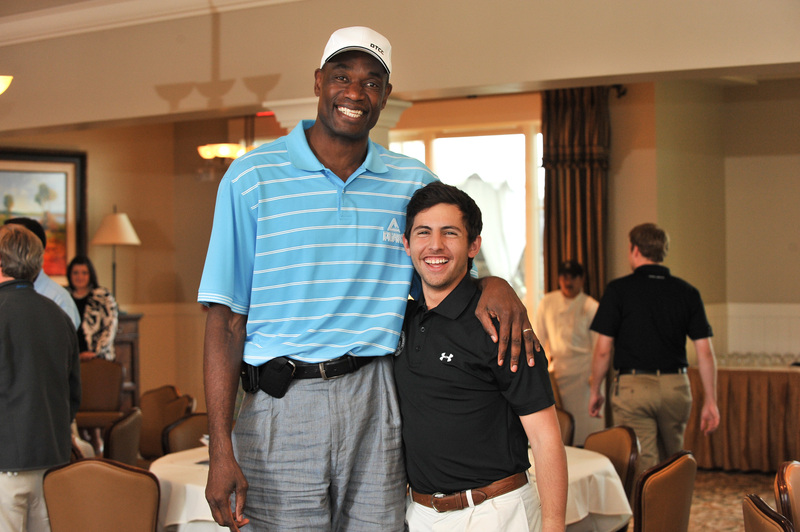 Naismith Memorial Basketball Hall of Famer Dikembe Mutombo meets with Gold Medalist Zoehair Asmail of Maryland. A well-known humanitarian, he founded the Dikembe Mutombo Foundation, dedicated to improving the health, education, and quality of life for people in his native Congo. 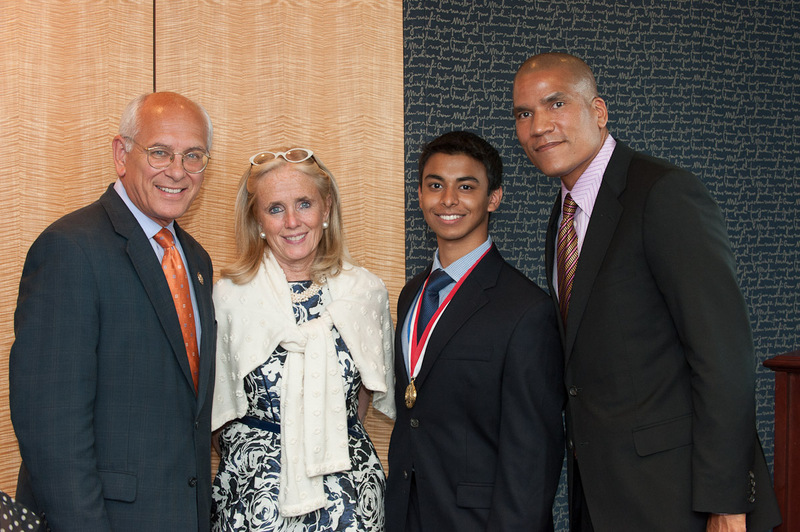 Debbie Dingell poses with Gold Medalist Alydaar Rangwala, Congressman Paul Tonko, and Chairman Paxton Baker. Before being elected to Congress in 2015, Mrs. Dingell was known for many years of dedication to countless community initiatives, such as the development of the Children’s Inn, the Barbara Karmanos Cancer Center, and the March of Dimes. 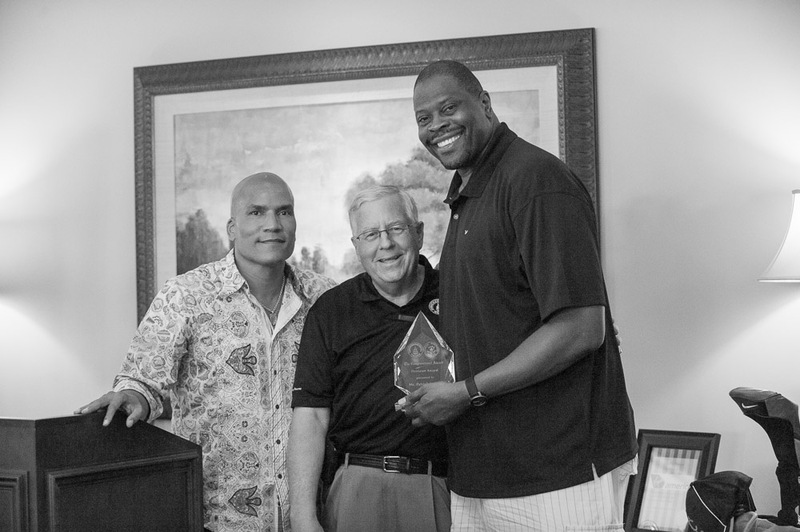 NBA Hall of Famer Patrick Ewing is recognized with the Horizon Award by Chairman Paxton Baker and Senator Mike Enzi. Ewing support of various philanthropic endeavors include Art for Life Charity and Children of Jamaica Outreach. 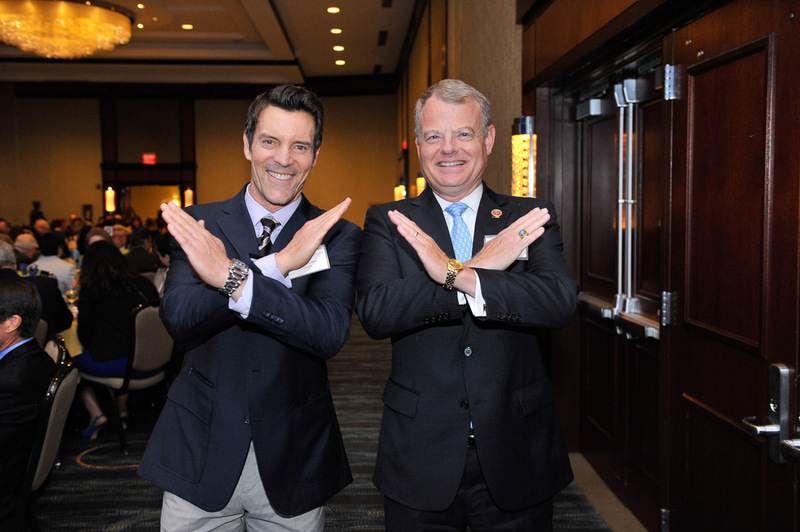 PX90 Creater Tony Horton poses with former Congressman Mike McIntyre. Mr. Horton worked with all five military branches worldwide on his “Ripped and Ready” tours. He has also worked on Capitol Hill and with the White House, with the First Lady’s “Let’s Move” campaign to increase fitness awareness and abolish obesity in America. 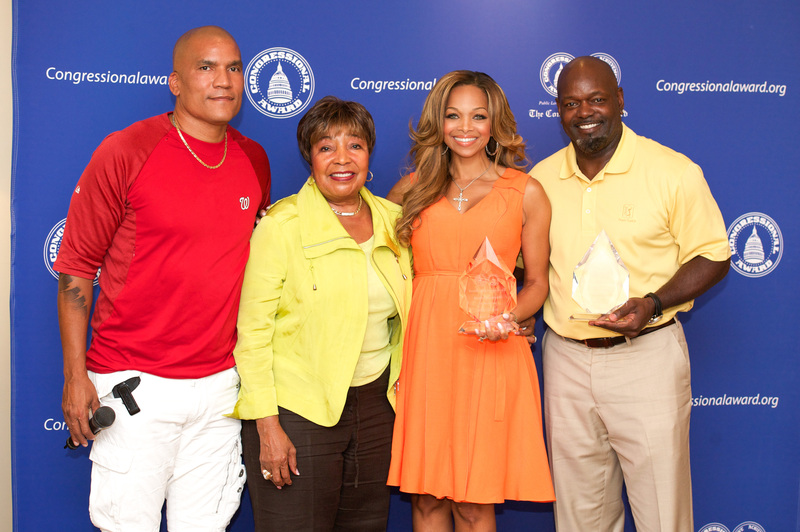 Congresswoman Eddie Bernice Johnson presents Mrs. Pat Smith and Mr. Emmitt Smith with Chairman Paxton Baker. Together, they steer the companies associated with EJ Smith Enterprises, Pat Smith Enterprises, Pat and Emmitt Smith Charities, and Treasure You. 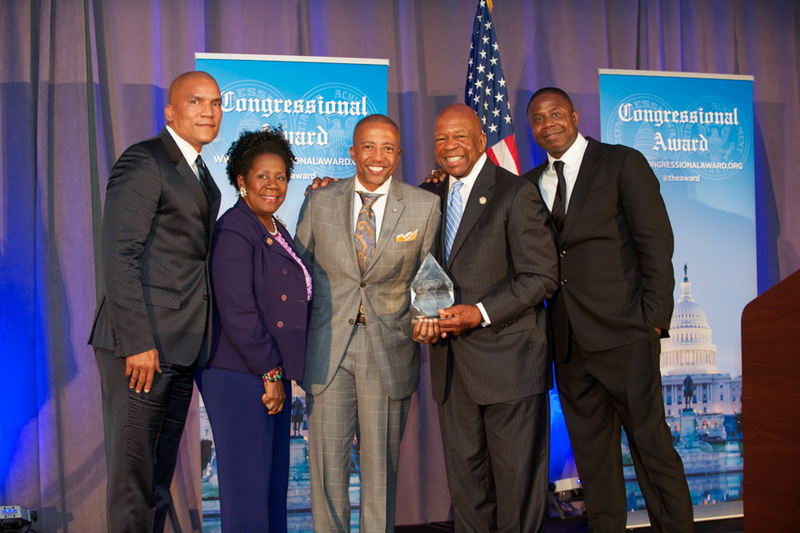 Chairman Paxton Baker, Congresswoman Sheila Jackson Lee, Congressman Elijah Cummings, and Doug E. Fresh present Kevin Liles (center). Former President of Def Jam Recordings, Mr. Liles has become not only an entertainment mogul but a philanthropic hero. His most impressive services are his local foundation, Kevin Liles for a Better Baltimore, and his Make It Happen Foundation. 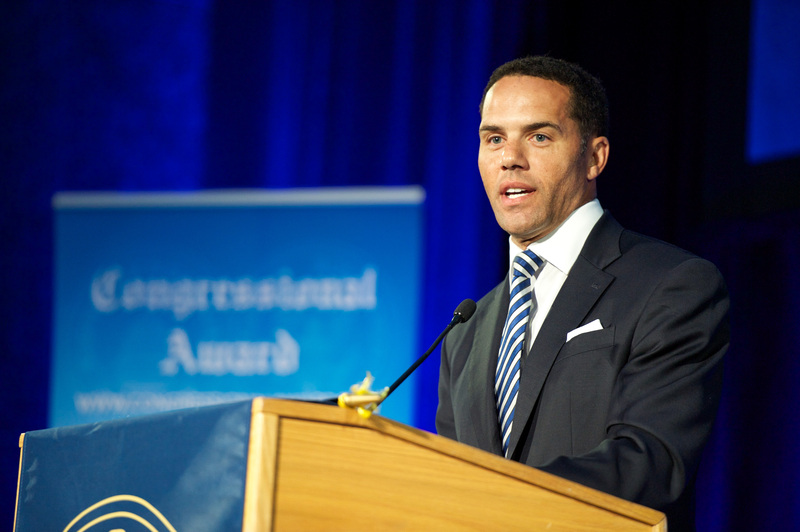 Steve Pemberton is Vice-President, Diversity and Inclusion for Walgreens Boots Alliance. One of America’s most inspiring executives, Steve brings a deep personal understanding of human differences to his position. He is considered an expert on matters of diversity and inclusion and its importance to the sustainability of organizations and the communities they serve. One of Time Magazine’s 100 most influential people, the accomplished actress has devoted much of her talent to social issues. Ferrera has focused on important issues for the Latino and millennial communities, including voter mobilization through organizations like Voto Latino. 2016 | CAL RIPKEN, JR.
Baseball’s all-time Iron Man, Ripken’s name has become synonymous with strength, character, perseverance, and integrity. Ripken is using the platform that baseball has provided him to help grow the game he loves at the grassroots level. The Ripken Experience complex hosts ballplayers and teams from across the country for camps and tournaments throughout the year. Revered as one of the finest defensive players in NFL history, Chris played 15 seasons and earned eight Pro Bowl selections, membership in the NFL’s 1990 All-Decade Team, and induction into the Pro Football Hall of Fame in 2012. Chris was honored for his charitable contributions to the Celebrity Charitable Network, Boys & Girls Clubs, and Warriors for Freedom. The NFL’s 5th all-time leading rusher also earned five Pro Bowl selections, Offensive Rookie of the Year, and induction into the Pro Football Hall of Fame. He founded the Curtis Martin Job Foundation to provide financial aid and hands-on support to single mothers, youth charities, individuals with disabilities, and low income housing providers. Learn more about Martin’s humanitarian efforts.